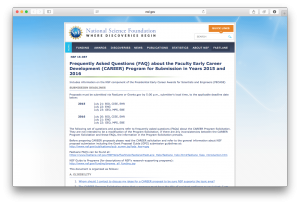 The National Science Foundation has released a helpful FAQ document on their website for investigators who are interested in applying to the Faculty Early Career Development (CAREER) Program in 2015 and 2016. The document provides due dates for CAREER proposals to the participating NSF directorates, as well as information on eligibility and tips for proposal writing, budget preparation and application submission. Click here to view the FAQ page. Contact OSP at 254-710-3817 if you are interested in applying for a CAREER award.